Jose "Ivan" Nuñez Martinez was taken into custody in January, when he and his husband went to U.S. Citizenship and Immigration Services to begin the process of applying for a green card. He was released in October but still faces possible deportation. (Undated) –Christmas Day came and went more than a week ago. “Wherever we’re traveling, we pick up something for the Christmas tree,” Nuñez Martinez. The couple has been savoring the holiday — and what can feel like borrowed time — after Nuñez Martinez was arrested by U.S. immigration enforcement officers almost a year ago. “Christmas means a lot to me and a lot to him, so it was great … to have him home,” said Frame, who’s 58 and grew up in Chester County. Nuñez Martinez, more than a decade younger and from Michoacán, Mexico, has lived in the U.S. for nearly two decades without an immigration status. In 2016, they married. Last year, Nuñez Martinez made headlines as one of a number of immigrants arrested during interviews at U.S. Citizenship and Immigration Services while trying to legalize their status. U.S. Citizenship and Immigration Services does not enforce immigration laws — it’s the agency where immigrants apply for visas, green cards, and other changes in status. It is under the same department, Homeland Security, as U.S. Immigration and Customs Enforcement or ICE, which does carry out arrests and deportations. 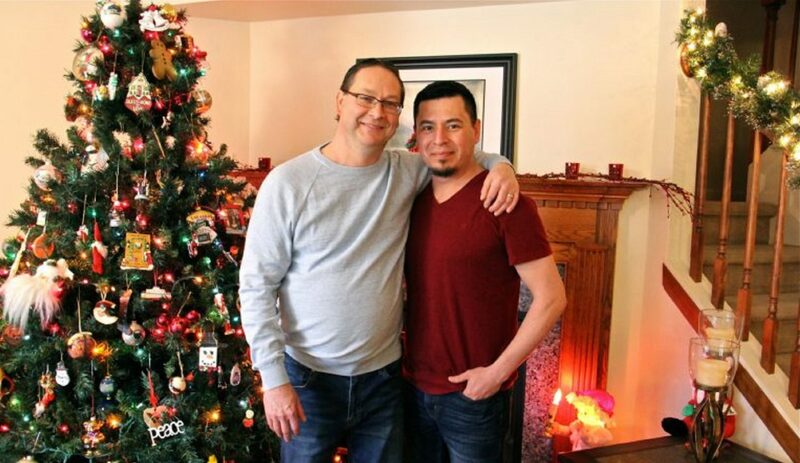 Paul Frame (left) and his husband Jose “Ivan” Noe Nuñez Martinez celebrate the holidays at home in Chester County. As immigration enforcement ramped up under the President Donald Trump, Frame encouraged his husband to start applying to change his status and work toward a green card, based on marriage to a U.S. citizen. While he was able to file that paperwork, Nuñez Martinez was also eligible for deportation because he twice crossed the U.S. southern border illegally. Frame said he now knows what he didn’t know then — that their marriage doesn’t necessarily outweigh those illegal entries. Requests to ICE press officers to comment for this story returned auto-replies, saying that officials are “unable to respond to media queries” during the government shutdown. The agency has previously said Nuñez Martinez was arrested for being “unlawfully present in the United States” aftering being picked up and deported near the U.S.-Mexico border in 2010. An immigration judge released Nuñez Martinez from immigration detention in York County in October, but not because he won his immigration case. A recent court ruling cleared the way for his release on bond: For $10,000, he could wait for resolution of his case outside prison. New house because, when he was arrested, he and Frame were preparing to move. New job because he decided not to go back to 12-hour shifts at a garage. Instead, he’s landscaping part time and helping Frame at his family’s cattle auction. He wants to work less now and spend more time with Frame and their 8-year-old rescue dog, Buffy, in case he is eventually deported. Nuñez Martinez’s options for staying lawfully are limited. If he is deported, he would face significant hurdles to be able to return. 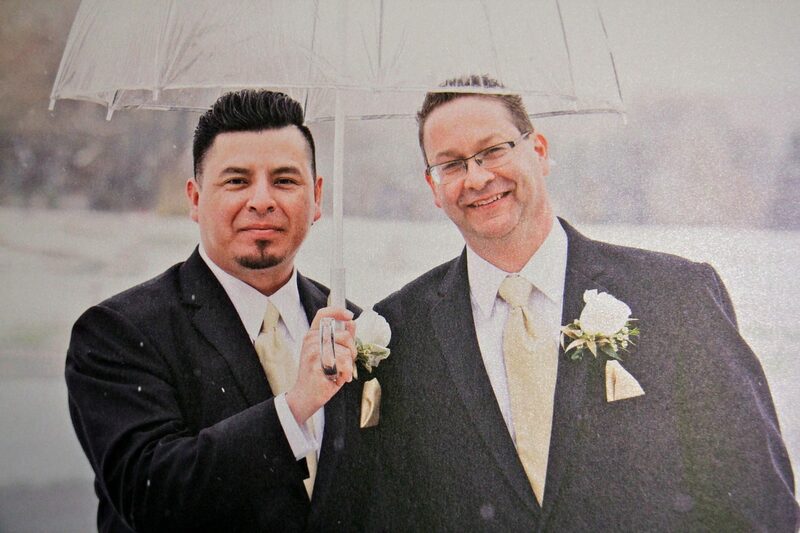 To try to stay, he has applied for “withholding of removal,” a request to halt his deportation because he’s faced threats as a gay man in Mexico. The bar to qualify for that humanitarian protection is very high, even more difficult than obtaining asylum. So far, one immigration judge has denied his request, saying the threats in Mexico didn’t go far enough to count as persecution. The petition is currently before the Bureau of Immigration Appeals. Nuñez Martinez’s attorneys argue that the threats — and the fact that the Mexican police are not necessarily standing up to protect LGBT citizens — do qualify him. Local LGBT rights groups and the American Civil Liberties Union of Pennsylvania have championed his case. “Conditions in Mexico are sufficiently bad for people who are ‘out’ that they are not only afforded the protection by governmental forces, but are actually victimized by them,” said immigration attorney Gonzalo Peralta, who has worked on the case. The appeal could take a year, more if he loses and appeals to federal courts. In the meantime, the couple is thinking about the trips they’d like to take together in the new year. Perhaps California, to visit loved ones, and a short trip to see Mariah Carey at the Sands Casino in Bethlehem. But they also think about what it would mean to have to leave the United States. “I try to keep that not in my mind, but it’s always in my mind. It’s stressful,” said Frame. “We’ll see. One day at a time,” responded Nuñez Martinez. It’s one trip they’re not looking forward to.